Report card testing can be tricky in kindergarten. Many standards must be tested one on one with students, and exactly what to test in each quarter can be hard to figure out. 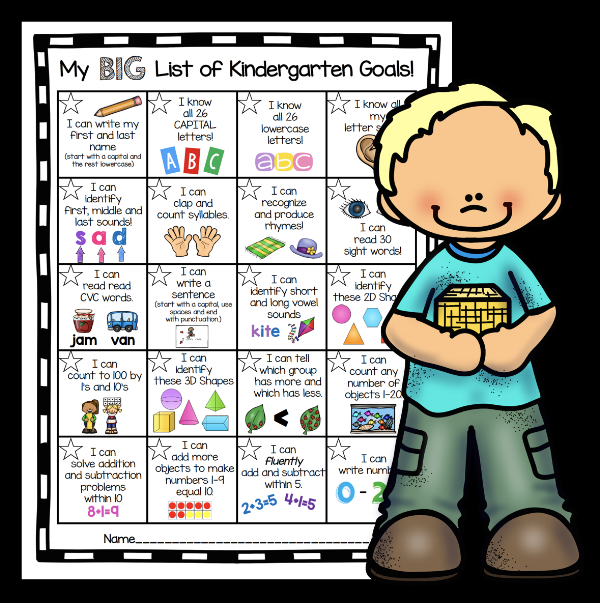 I looked at the Common Core Math, Reading and Writing standards for kindergarten and broke the "BIG" goals down into quarters. What do students really need to master to be successful moving forward? This handout is a great overview for you and parents to see what will be tested and expected of students in each quarter. Simply check the box if students mastered each goal in the quarter, and I send these home as the front page of our report cards. Some report cards I have used were complicated and not exactly user friendly. Parents had a hard time understanding and seeing what was even expected and being tested. My goal was to create an easy to understand report card format that also made report card testing itself a lot easier on the teacher. This kit has everything you need! Every quarter we focus on FIVE reading/writing goals and FIVE math goals. I just circle "MASTERED" or "NOT MASTERED" under each goal so parents can quickly see what their child mastered for the quarter. 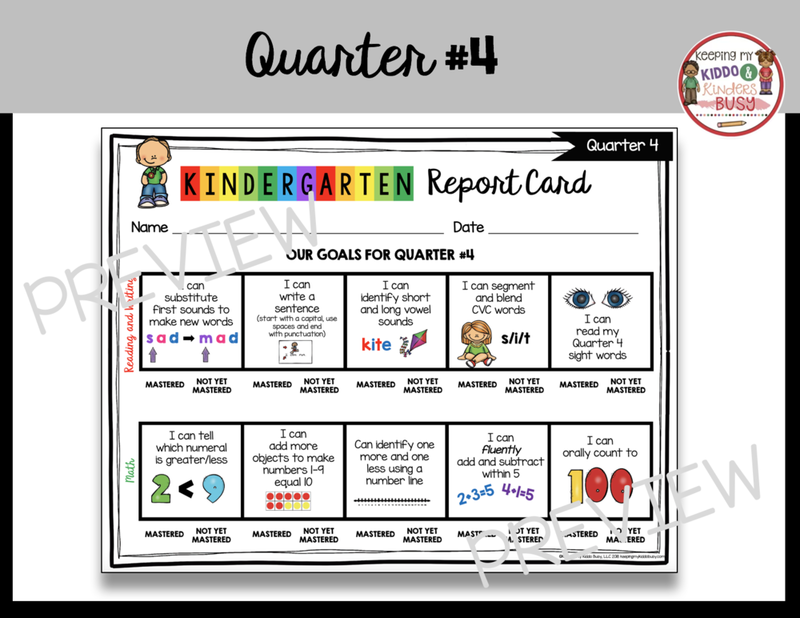 The other page(s) of the report card go into more detail on each goal, and the assessment kits match perfectly to the report cards. So if students did NOT MASTER "I know all 26 lowercase letters" this second page shows parents exactly which letters they do not know. It is straight forward for you, students and parents to follow! These kits are pre-made and are not editable. They correlate perfectly with the report cards! All standards are common core aligned, and there are two mats for each quarter. Simply print, place in page protectors or laminate and you're ready to assess students! Both the assessment kits and report cards come in color and BW for your convenience. I use these to assess my students one on one, and the coordinating report cards make this go very quickly. For example, in the picture above, I am assessing a student on our quarter 1 goals of knowing capital and lowercase letter names. As the student is reading off of the assessment binder, I am recording her answers directly on to the report card. Because I don't have a full time aide or help, I do a couple activities on the report card whole group with privacy folders. Students can write their names and numbers (depending on the quarter) as a class. This saves a lot of time so when I pull students one on one, I can assess the other standards. This gives you awesome data and a snapshot of exactly what students know at each quarter in the year. The place for student's name, date and what sight words you're working on each quarter are editable for you to type. Or if you prefer, print the regular copy and you can handwrite these parts in. The 5 main reading/writing goals and 5 math goals each quarter are NOT editable. The pictures and graphics are NOT editable. 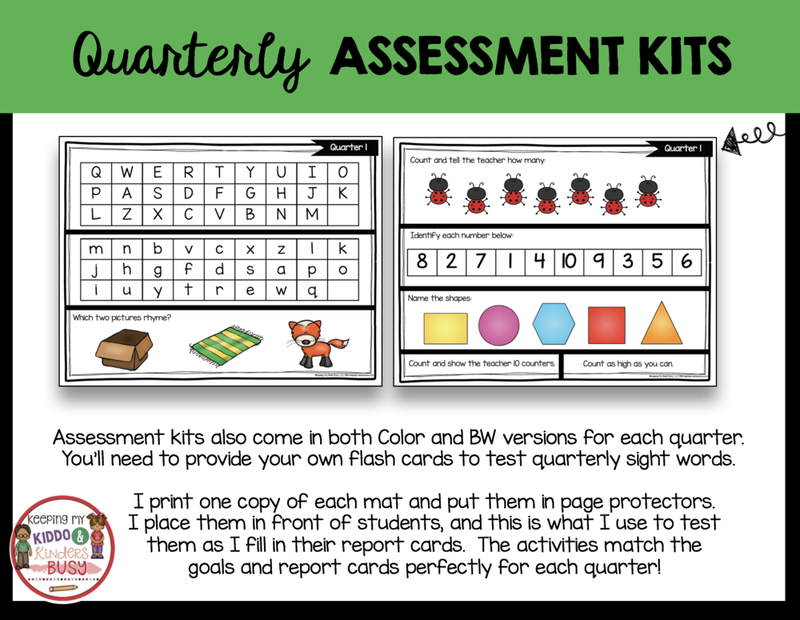 This assessment kit tests very specific skills each quarter that fit with most schools/districts. What if you're working on other standards/goals that are not covered? I included an editable page for you to type up to SIX additional standards/goals you're working on for each quarter. This is perfect to add science, social studies, or simply other math and reading goals I did not include for each quarter. Each report card then comes with a second page (and sometimes third page) that goes into more detail for each standard and correlates with the assessment kit mats. This is of course an optional form for you to include with report cards. It comes in BW and color. The goals are not editable, but the place to type student names, the date and teacher comments can all be done using Adobe 11 Reader. I feel that self reflection is so important for kiddos to do each quarter! This is a super simple and easy to follow format for kinders. They are not editable and come in BW. I have my students do these each quarter - they simply color/circle the thumbs up or thumbs down. This will remind you which standards you may need to go back and reassess the following quarter if a student did not pass the previous quarter. Instead of wading through a bunch of paperwork, I like to be able to quickly see what standards I need to assess for each student every quarter. 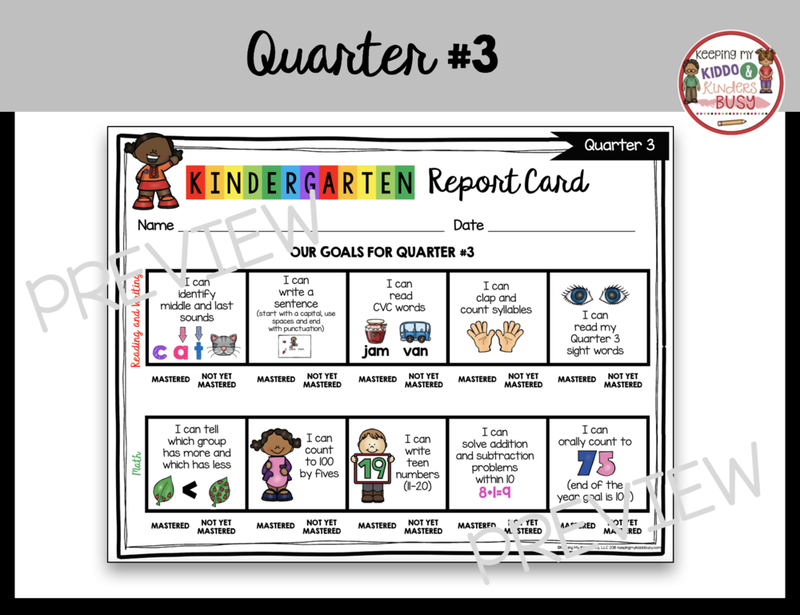 Kindergarten report card testing made easy! I tried my best to make this report card and assessment kit compatible with any curriculum. 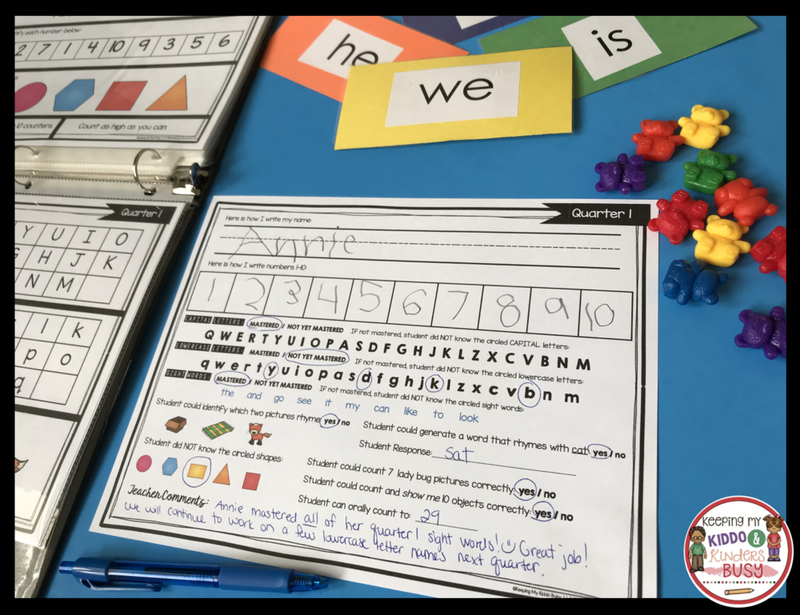 It covers the BIG goals we focus on in kindergarten, and of course if there are additional standards you wish to include simply use the editable Additional Goals We are Working On form. For editing, you must use Adobe 11 Reader (free to download at adobe.com) and basic editing directions are included for your convenience. Please note that the pre-made report cards DO NOT cover every single Kindergarten Common Core Standard. This kit correlates perfect with my Kindergarten Goals and Awards bundle! Students love to color their stars and receive awards when they master a new goal/standard. You can see my entire post on this kit HERE.